After finishing my season of rangering in Escalante, my future ex-wife Lisa came to Utah for a little exploring. 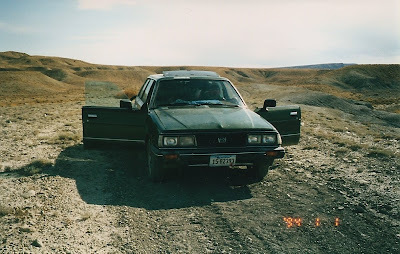 I picked her up at the airport and we went for a long road trip through some really remote areas of Utah in my '83 Subaru. After our trip she returned home to Indiana and I headed to Missoula, Montana to my winter job, and where I had been living for the past several years. Some time during that winter I saw an ad in a local paper that was seeking "suby tales". Apparently they were seeking stories of subaru owners adventures that were a result of their car. I thought I had a perfect scenario to suit the story line so I sent in the submission below. Suby Tales 11/01 My story is the result of a breakdown that happened in Southern Utah while on a road trip with my new girlfriend, Lisa. 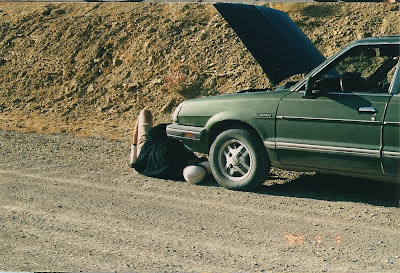 We were on a 7 day trip and while crossing a low pass on dirt road in the Henry Mountains west of Starr Spring campground my 83 Subaru overheated because of a thermostat that was stuck closed. I knew I had to remove the thermostat, but would be really screwed if I couldn’t salvage and re-use the gasket, which would result in the cooling system not being able to hold the coolant. I took the thermostat housing apart and the gasket came off in several pieces, totally trashed. Lisa from Cincinnati was fascinated with the silence of the surrounding country and didn’t seem to mind the down time. She went for a hike, took pictures of my pitiful looking Subaru, laughed at me, and then made us a bagel sandwich. Thinking about what to do now made me really nervous. We were miles from the end of the pavement, and even more miles from the closest so called town at Hite Marina. The tow truck would surely cost more money than I made all summer rangering for the Grand Staircase Escalante Nat’l Monument. I went for a short walk to kick rocks in the desert and collect what ever thoughts the dirt could offer. I came back to the car and got out the roll of duct tape. I copped a comfy squat and began to layer the duct tape onto the thermostat housing, hopefully forming a new gasket. I sharpened my pocket knife, cut out holes for bolts and water passage, and bolted it to the engine. I filled the system with coolant and started the engine. A couple hours later we rolled into Hite Marina where I called the auto parts store in Blanding and ordered the parts I needed. The good ol boy on the phone told me he’d “have em in the mornin”. Lisa, as usual, had a good time checking out the scenery, the suby was smiling wide, and my nerves needed a Missoula beer when we pulled into Blanding later that evening. I couldn’t believe it! A couple days later I dropped Lisa at the airport in Salt Lake City then came on home to Missoula for the winter looking for the first chance to pass the good karma along.